Compiled by Jill Wilson, Bombay Scout Group Leader 2014 with contributions by Neville and Noeline Flay, Grant Frost, and Karen Long. Scouts started in Bombay at the St Peters Anglican Church by Reverend Mark Mete with David Gummer and Neville Flay assisting. Scouting continued for several years until Mark left the district. Scouts went into recess until 1973 when Area Scout Leaders approached Bombay about restarting a Scout group. The following committee was formed. The old Paparata Hall and Methodist Church (as it was not in use) were suggested as a venue for a den. It was decided as the church was central, it would be more suitable, however before it could be used it had to have toilets added to the building. After several working bees, work was completed. The newly formed Scouts and Cubs began. As a new group starting with no funds available for equipment, tents etc., the committee, parents and leaders had a busy time fundraising which included bottle drives, sausage sizzles and collecting scrap metal from around the district with the help of Kerry William's truck and Neville Flay's tractor. 1975 Cubs visited the national Jamboree at Tokoroa for a day. Neville Flay and the Scouts flew to Oamaru Jamboree with the Counties Contingent. Bombay Scouts and Leader attended Hastings Jamboree with Papakura District Contingent. John Tupuhi, Rod Logan and Kevin Plummer supported Neville Flay as Assistant Scout Leaders through the early years. Ian Brice and Nigel Dobbs held Scout Leader positions in the 1980's. After 8 or 9 years settled in the den with Scouts and Cubs, to our dismay we were informed by the Methodist Church Trust that the land and building were to be sold. The group moved over to the Bombay Junior Boys Rugby Club. Ken and Judy Dyer became involved with Cubs in 1978, Hank Peiters was Cub Leader and the Assistant Cub Leader was Kim Peiters. Within a short time Ken Dyer became Assistant Cub Leader. When Hank left, Ken became Cub Leader with Judy and Diane Flay as Assistant Cub Leaders. In 1982 Ken left, Judy became Cub Leader and Diane Assistant Cub Leader. In 1984 the Dyers left for Fiji and Diane became Cub Leader with Janet Commins as Assistant Cub Leader. The Scout Association of New Zealand and Franklin District Council entered into a lease agreement on the Bombay Local Purpose Reserve (now known as 31 Paparata Road) situated next to the Playcentre. The Scout Group applied to the Franklin County Council for an interest free loan of $10,000 for den construction. On Ken's return from Fiji he became Committee Chairman and arrangements were made to uplift the loan and build a kit-set den, with Neil Campbell as Construction Manager. Through much fundraising, planning, community support, a loan and the tremendous efforts of the Bombay Lions who provided the labour, an Aitkenhead Plywood building was erected and opened in 1989. Fundraising continued for a number of years as the loan repayments were $1,000 per year for 10 years and this was paid in full before due date. Two of the Scout Committee were required to personally guarantee the Council Loan. From 1989 through to 1994 Terry Shaw held the position of Cub Leader, with Grant Frost taking over from Terry. Activities included eeling, campfires, trolley derby and making and using fishing rods. Also holding a Dads night's when the father's visited the cub pack and explained to the children their job or occupation. The cub pack grew to the extent of 20 plus children therefore creating the need for a second cub pack to be started. Other leaders during that time included William and Trudy Biggelaar. In 1994 Bombay Scout Group celebrated its 20th anniversary with a gathering at the den of leaders and parents, both past and present. A static display depicting an outdoor/camping scene was set up and a celebration cake was cut. 1996/97 Major work was carried out in the form of recladding the den in Colorsteel. Later, a large veranda and storeroom were added, around 2004. Bombay Scouts had been in recess for approximately two years when Trudy Biggelaar (Group Leader) organised a public meeting in 2001 to gauge interest in restarting. At that meeting Annie Bruce, Katrina Wilson and Karen Long agreed to start Keas and soon after Cubs was also started with the assistance of Shayne Holloway and Leo Brady. Some of the other leaders involved in this time were Cherie Lemon, Cliff Whitehouse and Andrew Hofer. Bev Callander did a fantastic job as treasurer during this time. As the children progressed, Scouts was started in 2004 with Shayne moving to the Scout section and assisted by Robert Long. Scouts attended two jamborees – the first was in January 2005 in Fielding. All had a fabulous time and the jamboree will be particularly remembered for the wet weather. It did result in coming home a day early as the Franklin site was flooded despite the best Scouting efforts to build trenches around the tents. Christchurch jamboree in January 2008 had lots of adventures and although a norovirus outbreak curtailed some activities such as swimming at QE2 Park this was replaced with several other activities. Bombay Scouts appeared to be able to avoid this virus and had lots of fun. For both jamborees the local Bombay Lions helped financially to assist each Scout to attend and this was most appreciated. Bombay Scout Group themselves fundraised for jamborees and hall equipment in several different ways including sausage sizzles; pancake breakfasts, delivering blue recycling bins around Franklin, discos and raffles. Many camps including indoor and outdoor were attended for all sections and there was always a good attendance at the Bombay Anzac Day Parade. During this period, maintenance and up-grading of the Scout Den included having the floor polyurethaned, lights installed, a railing put into the attic storage area, vinyl flooring installed in the kitchen and toilets and the kitchen and hall cupboards were painted. Bombay School used the den prior to their own school hall being built and Bombay Playcentre used it for several months when they were having alterations done. So it has been a good use for the whole community. In May 2008 the Cub Pack at Bombay was re-started with Jill Wilson as Cub Leader. She was assisted by Jeremy Long, (son of former leaders) who was the Pack Activity Leader until 2012. This volunteering was a requirement for his Duke of Edinburgh Award. After three weeks of learning their Cub Badge, seven boys were invested. Funding was obtained in 2010 which was used to have the exterior of the den commercially cleaned. Over the next couple of years the Cubs enjoyed lots of fun activities and outings but unfortunately section numbers dropped to five children in September 2011. An information flyer was sent to the local schools and a successful public meeting was held resulting in a new Kea Club being started with 12 children and two parents, Victoria Stonyer and Sally Grey, volunteering as Kea Leaders. Queens Birthday Monday. Scouts, Guides and families from around the Counties area gathered at the top of Bombay Hill (Paparata Road), to celebrate the Queen's Diamond Jubilee. A beacon/bonfire was lit and could be seen for miles around. We had great publicity with several photos in the Franklin County Newspaper. October 2012 Youth numbers in the Kea Club remained steady at 10, however leader changes included Donna Lowry replacing Sally Grey who resigned. At the November 2012 group Annual General Meeting, a front fence was requested by the Leaders to ensure the safety of the Keas and their younger siblings. Funding of $1,000.00 was received from Holcim (New Zealand) Ltd and a new fence was duly erected. Many thanks to Victoria Stonyer for organising this grant application. Further leader changes in October 2013 saw Rachel Reader become the Kea Leader replacing both Victoria Stonyer and Donna Lowry who resigned. Unfortunately in May 2014 Rachel also resigned as leader and the Kea Club is now in recess. Hopefully in early 2015 the Kea Club can be re-started. Mid 2013 with youth numbers increasing in the Cub Pack, parents Amanda Van Dalen and Raewyn Anderson became Cub Leaders. Raewyn also took on the role of group treasurer from Sara White who had done a fantastic job over the previous four years. Congratulations to cub Tim Harrington, who was awarded a special certificate, sent by the Scouts New Zealand National Cub Leader, recognising he has completed all twenty seven cub interest badges. Over the last few years, Bombay has joined with many of the other Cub Packs from around the area and enjoyed the Counties Zone Cub camp. Each camp having a specific theme and various venues including, Camp Sladdin in Clevedon – 2010, Awhitu Regional Park – 2011, Camp Rutherford in Whitford – 2012 and the Port Waikato School Camp - 2013. This year we head to Motu Moana Scout Camp in Green Bay, Auckland. It was also time for five of the older cubs to become scouts, so in September 2013 the Bombay Scout Troop was restarted with parent Wiebe Boxem, becoming the Scout Leader. They enjoyed their first camp together in early July 2014, duly named "Brass Monkey" because of the cold winter. Group activities over the last couple of years have included a bonfire and family fireworks for Guy Fawkes Day and a family Christmas barbeque with a kid's swim held at the Bombay School. Other activities included a sleep-over at Kelly Tarltons Underwater World in central Auckland, along with a couple of campfire nights, a water slide and a sleep-over at our den. The group has also visited local emergency services including the Mercer Fire Station and Pukekohe Police and Ambulance Stations. As in earlier years the Scout group has been part of the Bombay Anzac Day Parade and ceremony, with good attendance and group numbers growing each year. Unfortunately because our group didn't have a Scout section (until recently) we haven't attended the last two NZ Scout jamborees. However planning is underway to attend the 21st jamboree to be held in Renwick, Marlborough starting 29 December 2016. Every three years there is a national jamboree. For the 18th, which was held in December 2007/January 2008 in Christchurch, more than 4500 scouts, leaders and volunteers participated. The centenary of scouting both worldwide and in New Zealand was a main focus of the jamboree. Contingents from Australia, Japan, Fiji, Indonesia, the UK and individuals from many other countries joined with the New Zealand scouts on jamboree. 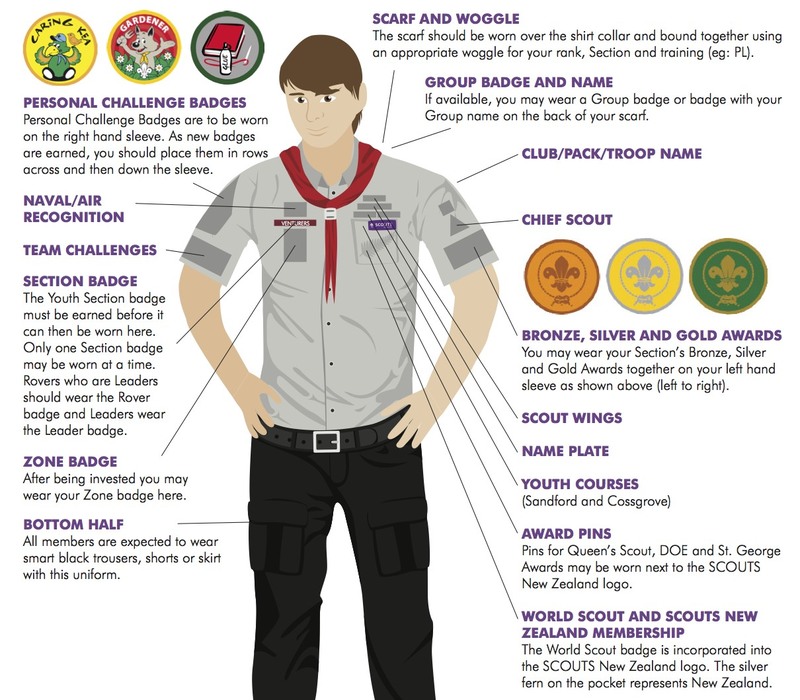 This is the junior most section of Scouting New Zealand for youth aged 6½-7½ and is the equivalent to the Beaver section in the UK. Adult leaders present a highly active program each week so that a real emphasis is placed on interaction with other children in the Kea Club. The program includes a wide range of games, nature and outdoor appreciation, creative play, singing, stories and craft work, with the emphasis on having fun. Cubs, aged 7½-11½, meet as a 'pack' and participate in a program that is flexible and organised to cater for individual activities, for small groups known as 'sixes', as well as for the whole Pack. Leaders and parent-helpers manage a fast moving and imaginative program that places emphasis on learning by doing. Cubs are able to pursue individual interest badges. Think of others and do a good turn every day. Scouts, aged 11½-14½, are organised into patrols, each patrol having its own youth leader known as a Patrol Leader. This gives the Scouts the opportunity to choose their own activities, and for the Patrol Leader to develop leadership skills. The patrols are encouraged to plan and organize activities such as tramps, camps, cycle tours and canoe trips in order to develop teamwork and self-reliance. Adult Leaders are responsible for running an exciting and challenging fun programme based on the Scout method of working in small groups and using the outdoors. The aim is to encourage and foster opportunities for the Scouts to experience leadership and teamwork. A progressive award scheme enables scouts to learn a range of new skills and earn badges, as well as working on both personal challenges and group activities.